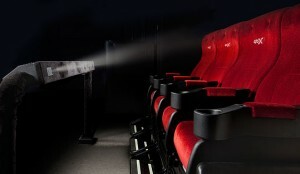 A Regal Entertainment Group movie theater in Los Angeles will be the first theater in the U.S. to get new 4D technology. AEG, a global sports and entertainment presenter, announced Monday that it has signed a deal with a South Korean company, CJ 4DPlex, to open a 4D theater at Regal Cinemas L.A. Live Stadium 14 in Los Angeles this summer. “Los Angeles was the natural choice for the first U.S. location to carry 4DX. We wanted to bring this experience to where all the movie magic happens,” Byung Hwan Choi, CEO of CJ 4DPlex, said in a news release. Officials with Knoxville-based Regal Entertainment, the largest movie theater operator in the U.S., could not be immediately reached for comment. The new movie technology delivers an “immersive 4D experience to excite all five human senses. Features include motion, wind, strobe, fog, vibration, mist, rain and even scent-based special effects that go far beyond 3D,” the release says. Some 14,000 4D seats are currently available in 91 theaters in 23 countries. It’s uncertain how fast 4D tech will spread to other U.S. theaters or if it will make it to Knoxville. But it would be cool way to experience a blockbuster action movie. AEG is a wholly owned subsidiary of the Anschutz Company, a major investor in Regal Entertainment. CJ 4DPlex is the world’s first 4D cinema company for feature films. Headquartered in Seoul and with international offices in Los Angeles and Beijing, the company provides 4DX cinema systems for exhibition partners along with 4DX codes of major Hollywood titles. This entry was posted in Regal Entertainment Group and tagged 4D technology, Anschutz Company, Byung Hwan Choi, CJ 4DPLEX, fog, mist, rain, Regal Cinemas, Regal Entertainment Group, scent on March 25, 2014 by Roger Harris.